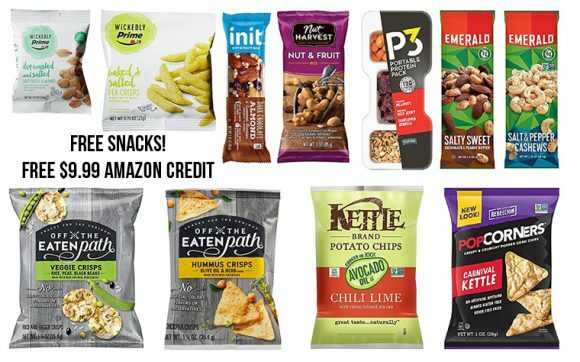 Buy a Snack Sample box (with free Super Saver shipping) from Amazon and get a $9.99 credit from Amazon for future snack purchases. For a limited time, buy this snack box for $9.99 and receive an equivalent credit toward a future purchase of select products shipped and sold from Amazon.com. A week after your product ships, you will receive an email with instructions on how to use your promotional credit. Limit one promotional credit per customer. Sample box is available for Prime members only. Offer available for a limited time. Items may vary based on availability. Each box contains 10 or more items from participating brands.